Dairy farmer gross margins are set to increase again this year on the back of strong performance in 2013 and will see the enterprise move even further ahead of other enterprises according to Teagasc’s Mid Year Outlook for Irish Agriculture. The report says it looks like sheep prices in 2014 will be higher than in 2013, ensuring a strong rebound in the margins earned from lamb production. While the average annual milk price will be close to that recorded in 2013 and with lower costs, it is likely that dairy margins will improve over those earned in 2013. Turning to beef, the outlook for 2014 is more mixed. Prices for younger cattle are likely to only decline marginally in 2014 relative to their 2013 price level, with lower production costs, margins on single suckling enterprises, particularly those selling weanling and/or store cattle, are likely to improve, relative to 2013. Finished cattle prices in 2014 are forecast to be as much as 10% lower than in 2013. As a result, it is likely that margins for cattle finishing systems will be slightly lower than the 2013 level. The significant fall in the costs of production are forecast to largely offset the large fall in output value due to lower finished cattle prices. For Irish cereal producers, the improved global harvest will result in an output price drop in 2014 relative to 2013. The price reduction looks like being of the order of 10 per cent, but it will still be some time before an accurate assessment of international harvest volumes can be made. The cereal price reduction will be partially offset by a slight increase in yields for the wheat crop relative to 2013, but barley yields are expected to be on a par or slightly less than those achieved in 2013. 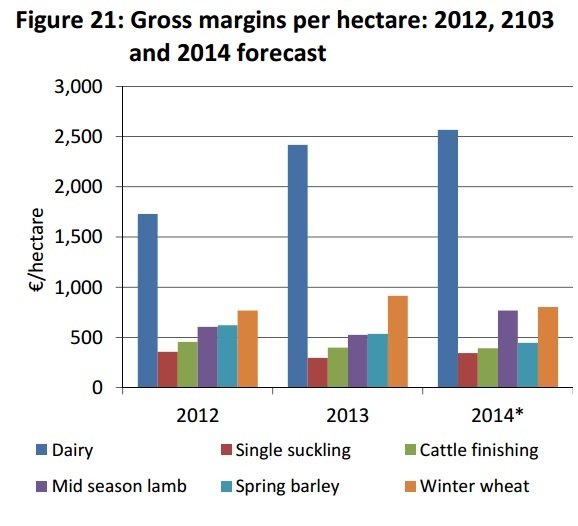 Cereal production costs per hectare should be lower in 2014 in comparison with the previous year. Overall, gross and net margins for winter wheat and spring barley are likely to be lower in 2014, as cereal price reductions outweigh cost reductions on most farms.